What's all this stuff about "Wilde," "Twain," "Eleanor" and "Elizabeth?" Who are you? Where are you? How can I learn about bees? How can I contact the beekeeper? What do you mean, "Urban Nature?" This is the story of a beginning beekeeper in a major US urban center and the bees she loves. Starting a several years ago, the beekeeper became entranced by stories of bees and their keepers, and dreamed of setting up a colony on the roof deck of a townhouse in a beautiful, tree-ful city. She ended up with two hives, though. Then ten.The blog starts with setting up the first hives and moves through the present. What is the deal with "Twain" and "Wilde" and "Ellie" and "Lizzie?" There are two colonies on the roof, and each one has it's own queen bee. It got confusing to constantly refer to "Colony 1" and "Colony 2," so I decided to name colonies after famous authors. Therefore I have colonies named after Mark Twain and Oscar Wilde. The Twain bees got off to a really strong start, while Wilde ran into significant problems. Much of my ruminating at first surrounds how to help Wilde to survive the winter ahead. Since then, I have branched out into ruminating about how to get bees in three locations through the winter ahead. Every bee colony needs a queen, the only bee a hive simply cannot do without. Keeping track of the queen is therefore way-totally-non-negotiably important. Like human monarchs, though, there is a certain amount of turnover, and you need to keep track of whether a queen bee is strong or old or fertile or mean. You even have to depose them sometimes. Therefore you give them names and track their progress. The First Queen of Wilde was Elizabeth, a British monarch for a British writer. Eleanor, named after Eleanor Roosevelt, was the First Queen of Twain. 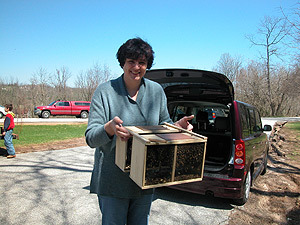 That's me on the left, on the day my bees arrived (we are at the pick up location, not our home). I am a forty-something city dweller with a career in publishing and corporate communications ...though don't hold me to that here. My husband is also a part of this project (photographic director), despite some major initial anxieties. We both share a love of critters and our home is filled with an inadvisable array of mammals, fish, and visiting birds. About our specific location: we are not trying to be cute, but just now we aren't telling. We are in a city, and have lots of neighbors, some of whom may not be thrilled by their 20,000 new community members (too many killer bee movies, I think). The plan is to 1) make two colonies survive and thrive through this year and next winter; and 2) tell the neighbors about this project when we can hand them a bottle of honey as well as the news that they have safely lived a whole year with it. You might say it started with birds: yup, birds and bees. Or maybe gardening. Or maybe riding my bike to work when my office was downtown. What happens is that you learn a little bit: the south side of the back yard is climactically three weeks behind the north side in the Spring; the cardinals at the feeder always show up as Mr. and Mrs.; every evening in Summer, the local Mr. Robin lands on the highest roof finial on the block, and sings a beautiful sweet song that translates to "MINE MINE MINE;" you put a water feature in the garden, and all August you can watch the catbirds take showers in it. My relationship with the world around me changed, the more I paid attention to it. Just by watching. By having a reason to watch. I thought beekeeping was downright funny in 1987, when a fellow student gave me a jar of his honey. Now it is inextricably linked to the blooming trees, and the awareness that bees are in trouble and the growing world could use a hand, and that the small plot of habitat we have been creating here might be an excellent place for bees. And then you can blame the BBC. Seriously, check it out. My friend Mary points out that there may be a Bee Fad in the works, and I have read "The Secret Life of Bees" (AFTER I installed them, by the way). Hey, however it came up, I love it. There are beekeepers who start with books, and that can work, but the best way to learn about bees is to take a course with a local beekeepers association. You need another person to point out the differences between a queen and a drone, to show you how to use a hive tool, to tell you what-blooms-when in your area. Almost all beekeeper associations offer some kind of beekeeping short course. Here are some links: from the Eastern US, the Central US, the Western US, Canada (scroll down), and worldwide. The internet is also a vast and extremely chaotic archive of bee information. Don't be intimidated! Be ready to run into terms like varroa or tracheal mite control, pollination ins and outs, honey production statistics, and the like: these are realities of beekeeping and experts trade a ton of information on them in public. But you do not need to understand all of this to get started. The thing about bees is that they are almost self sufficient if you do not actively screw things up, but there is so much to know that the path seems to stretch forever ahead. Don't worry: you can have hives and honey long before you could get lost along the way. I'd prefer that you email me. What do you mean by "Urban Nature?" This is an environmental soapbox of a kind, but it is meant to be less tedious than it sounds. Most people seem to think of "human" versus "natural," a kind of dichotomy. But that is never really true, and you can see that in the wonder and joy people experience by watching flocks of wild parrots in San Francisco, coyotes in a Washington DC park, or manatees in a tough Miami neighborhood. People are a part of nature, and many of our behaviors in consumption, destruction, preservation, creativity, and so on can be understood as the natural reactions of a species in a complex environment. Instead of fighting who we are, maybe we can understand and integrate ourselves into the habitats of which we are a critical part. If we stay with the dialogue of fear and lecturing, we are playing into a lowest common denominator game. If we look at joy, alternatives, and acceptance, we might be able to do what we have to do in order to survive without making the planet pay the dues of anger and fear.